Back Testing - What Does It Mean? What is back testing? 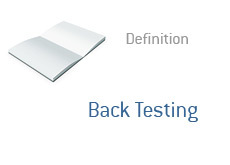 What is the definition of back testing? What does it mean to back test? Let's say that you come up with a great new way to make money trading Dow futures (and least, you think that it's a great idea). You have noticed a certain pattern in the DJIA and believe that you can exploit this to make some money. Before you actually start trading, you are well-advised to BACK TEST the idea. Back testing involves using historical trading data to determine whether or not a trading method or style might be profitable in the future. By back testing an idea, a person can get some sort of a feel as to whether or not their trading system might be profitable in the future. Successful back testing involves analyzing the results in a cold and impartial manner. Many people have an emotional attachment to their trading system, so they do something called curve fitting. Curve fitting can be hazardous to your financial health, and will very likely result in your trading system failing in the future. Back testing can be a very valuable tool in a trader's arsenal, but only if done in an impartial manner.